Perhaps the idea of Wal-Mart’s going green isn’t entirely beyond imagining. After all, today’s technology-intensive sustainable scene fits Wal-Mart’s early-adopter mentality, which has led the corporate behemoth to pioneer efficiencies like computerized inventory management. But Wal-Mart’s "everyday low prices" are partly a product of everyday low wages, its stores have contributed to America’s ex-urbanization, and its $i5 billion yearly trade with China has helped erode domestic manufacturing. The WaIl Street winner has an increasingly toxic image on Main Street. 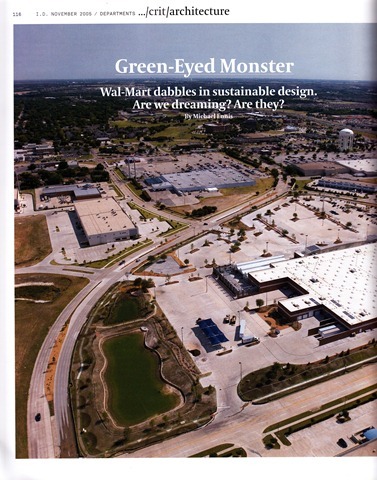 So when Wal-Mart opened its first environmentally correct Experimental Store in McKinney, Texas, in July, you didn’t have to be a cynic to wonder if "this next step in evaluating the impact we leave on the environment" (as a senior executive put it) wasn’t just the next step in cleaning up a public relations mess. Set in McKinney, Texas, a splashy Dallas exurb where luxury SUVs roam among prairie-baroque McMansions, the sprawling 10-acre science project is certainly a very small part of Wal-Mart’s empire. Along with a sister store opening later this fall in Aurora, Colorado, it’s a hopeful exception among thousands of energy-wasting eyesores. 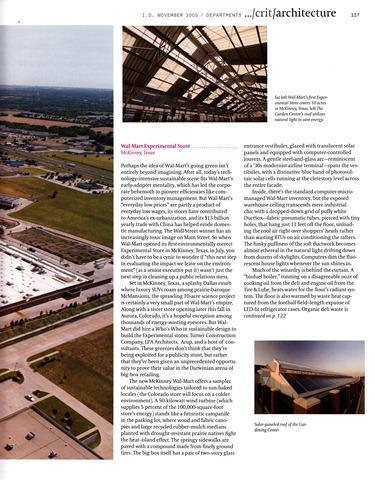 But Wal-Mart did hire a Who’s Who in sustainable design to build the Experimental stores: Tutner Construction Company, LPA Architects, Arup, and a host of consultants. These greenies don’t think that they’re being exploited for a publicity stunt, but rather that they’ve been given an unprecedented opportunity to prove their value in the Darwinian arena of big-box retailing. The new McKinney Wal-Mart offers a sampler of sustainable technologies tailored to sun-baked locales (the Colorado store will focus on a colder environment). A 50 kilowatt wind turbine (which supplies 5 percent of the 100,000-square-foot store’s energy) stands Iike a futuristic campanile in the parking lot, where wood and fabric canopies and large recycled rubber-mulch medians planted with drought-resistant prairie natives fight the heat-island effect. The springy sidewalks are paved with a compound made from finely ground tires. The big box itself has a pair of two-story glass entrance vestibules, glazed with translucent solar panels and equipped with computer-controlled louvers. A gentle steel-and-glass arc — reminiscent of a ’30s modernist airline terminal — spans the vestibules, with a distinctive blue band of photovoltaic solar cells running at the clerestory level across the entire facade. Inside, there’s the standard computer-micromanaged Wal-Mart inventory, but the exposed warehouse ceiling transcends mere industrial chic with a dropped-down grid of puffy white DuctSox-fabric pneumatic tubes, pierced with tiny holes, that hang just 1 1 feet off the floor, unloading the cool air right over shoppers ‘ heads rather than wasting BTUs on air conditioning the rafters. The funky puffiness of the soft ductwork becomes almost ethereal in the natural light drifting down from dozens of skylights. Computers dim the fluorescent house lights whenever the sun shines in. cooking oil from the deli and engine oil from the Tire & Lube, heats water for the floor’s radiant system. The floor is also warmed by waste heat captured from the football field-length expanse of LED-lit refrigerator cases. Organic deli waste is composted; air conditioning condensation is recycled through a collecting pond to drip-irrigate the grounds. The restrooms even do their part, with waterless urinals and sink faucets outfitted with solar-powered, infrared sensors. Dozens of graphics painted on the floors serve up just the facts on the relevant technology. Away from the store, shoppers can go to http://www.walmart-facts.com and get real-time data on how many kilowatts the wind turbines and solar panels are generating. But what has given this project real credibility within the sustainable industry is the promise of considerably more detailed information: Oak Ridge National Laboratory is monitoring the McKinney store with 200 sensors and will draw comparisons with data collected over the past three years from an old-fashioned Wal-Mart just blocks away. Citing a dearth of operating data from real buildings, industry insiders regard the Experimental stores as a watershed in analyzing the bottom-line performance of envirornmentally friendly technologies. Though definitive numbers confirming whether these technologies save money are years away, Wal-Mart already has the public relations formula down to a science. Sustainability doesn’t appeal just to the usual critics of Wal-Mart’s scorched-earth globalism, it also plays increasingly well with upscale consumers in staunchly Republican suburbs like McKinney. For a retail giant struggling to sell a more positive public image, that makes this store a winner right out of the box. We’Il see whether it remains one. This McKinney Wal-Mart is my local store. I have watched its performance since it opened to great fanfare. It has been open almost a decade now and from what the public can see it is fantastic. This WalMart appears to have had very little trouble. Behind the scenes may be a different situation, but what the public sees appears to function as designed. Recently I believe high wind caused a mechanical failure of the tail section of the large wind turbine and it was down for awhile for repairs. If they were going to discontinue its use I really wanted to buy it. I do miss the computer monitor at the store entrance that cycled through realtime output of various renewable energy systems, I would stand and watch the monitor while my wife went to the boring parts of the store. Whatever the end outcome I know absolutely that this store has been a positive exposure to renewable energy. I have had many discussiome with store shoppers about individual components of the system as well as the system as a whole 10 acre operating unit. The public responses I have heard seem to be overwhelming positive at WalMart’s experiment here. It has definitely changed a great many minds here in an oil/gas rich area of this country. Who would have thought? I applaud WalMart for thinking outside the box……the “BIG BOX” and hope to see other projects in the works, not just WalMart, but many more establishments following up on this experiment. Imagine energy independence for the USA and the benefits it can bring in many ways. I have myself purchased many photovoltaic panels recently and plan to install them on my next home. It is a great learning experience. 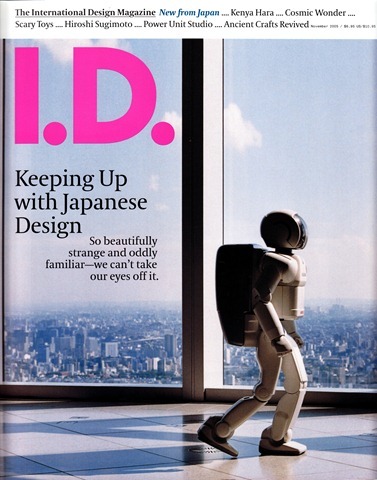 When we stop learning we start dumbing up. Knowledge is power. Thank you WalMart for helping to educate and as well as to lesson our carbon footprint in baby steps. We learn by doing and you did it.